Apple announced that they were investing $10.5 billion in supply chain robots and automation equipment and recently confirmed their acquisition of PrimeSense for $350 million (PrimeSense is the developer of the Kinnect 3D system used by MS Xbox)..
Amazon, in a CBS 60 Minutes piece aired last Sunday, displayed a new concept delivery system using an octocopter. Remember that in 2012 Amazon spent $750 million to acquire Kiva Systems, the robot technology enabling robotically-delivered goods to a picker/packer. And now Google has set up a robotics division headed by the man behind the Android operating system, Andy Rubin. In Rubin’s first six months he has acquired seven robotic companies to jump start his new operation. UPDATE 12-14-13: Google confirms its eighth acquisition: Boston Dynamics. The new acquisition is an engineering company that specializes in building dynamic robots and software for human simulation. The acquisition adds 80+ technicians, engineers and scientists to the new Google Robots Division talent pool – plus a new location. 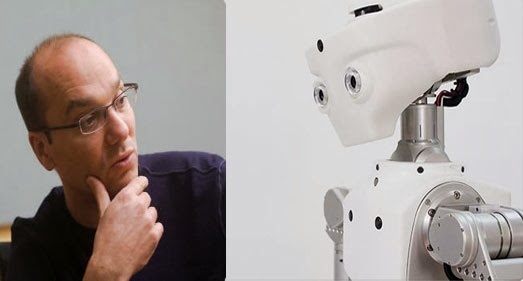 Andy Rubin and Meka robot. 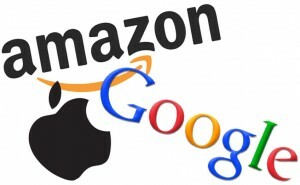 Google acquired 7 tech companies in the last 6 months. Schaft, a Japanese start-up developing a humanoid robot; Industrial Perception, a Silicon Valley start-up that developed a computer vision system for loading and unloading trucks; Meka Robotics, a robot developer for academia; Redwood Robotics, a start-up intended to compete with the Baxter robot (and others) entering the small and medium-sized shop and factory marketplace; Bot & Dolly, a maker of robotic camera systems used for special effects such as in the movie “Gravity;” Autofuss, a design and marketing firm and a partner in Bot & Dolly; and Holomni, a maker of powered caster modules for omnidirectional vehicles. Although Google won’t disclose their plans, the article suggests that the company’s initial market will be in manufacturing, e.g., electronics assembly, which is mostly done by hand. “Manufacturing and logistics markets not being served by today’s robotic technologies are clear opportunity markets,” said Rubin. The article suggests that the new Google robots will be able to automate any or all of the processes from the supply chain to the distribution channels to the consumer’s front door thereby creating a massive opportunity. Google is already experimenting with urban deliveries including making home deliveries for companies like Target, Walgreens and others. Google is transforming itself in many ways including its new robotics division. Its constantly transforming its search engine into a sophisticated learning machine using artificial intelligence tools. Some of that AI talent is moving over to the new Robotics Division. It’s been hiring super brains such as Ray Kurzweil and Peter Norvig and inhouse star Andy Rubin to head groups and divisions moving toward product development and even hardware manufacturing (remember that Google owns Motorola – a ready-made client for assembly and materials handling robots). Apple is investing $10.5 billion in new technologies and robotics to polish the new iPhone 5C’s colored plastic cover, to laser and CNC machines to carve the MacBook’s aluminum body, and for testing and inspection gear for iPhone and iPad lenses. Apple invested $6.5 billion on similar robotics and factory automation equipment in their previous fiscal year. Samsung has indicated it plans to spend $22 billion in capital expenditures this year but didn’t disclose any further details. Boston Dynamics, a 1992 spin-off from MIT, has been a great resource for youTube videos of wild robots. Their Big Dog video has been watched by more than 15 million viewers; their ATLAS robot video, the base robot given to the DARPA Robotics Challenge teams – a challenge to speed development of robotics technology for disaster response – has already passed the 2.5 million mark. This is not an insignificant acquisiton. An ongoing business employing 80+ highly paid engineers and scientists has to have cost Google a very high amount, perhaps in the low 9 figures. I think the yellow highlighted quote from Brian Gerkey sums up all these investments nicely: it’s a pretty exciting day for robotics when Google, Apple and Amazon ALL invest in robots and robotics. Others are likely to follow spurring further investment and innovation. Up until now, the big four of industrial robotics (KUKA, Fanuc, ABB and Yaskawa Motoman) were all foreign firms while two smaller American firms (iRobot and Intuitive Surgical) led the emerging service new-tech robotics sector. The remainder of this decade will be filled with amazing new robotics products from a variety of new providers — including Apple, Amazon and Google.